If you’re the kind of total nerd that looks up tables on Wikipedia for fun, you may notice a peculiarity: the American built-up area with the highest population density is Los Angeles, followed by the Bay Area and New York. This is not what anyone experiences from even a slight familiarity with the two cities. Some people leave it at that and begin to make “well, actually Los Angeles is dense” arguments; this is especially common among supporters of cars and suburbs, like Randall O’Toole, perhaps because they advocate for positions the urbanist mainstream opposes and enjoy the ability to bring up an unintuitive fact. Others instead try to be more analytic about it and understand how Los Angeles’ higher headline density than New York coexists with its actual auto-centric form. New York’s 70th percentile of density (shown as 30 on the graph’s y-axis) is far denser than that of the comparison cities. The term the urbanist blogosphere defaulted to is “weighted density,” which is the average density of census tracts weighted by their population rather than area; see original post by the Austin Contrarian, in 2008. But one problem remains: Los Angeles is by any metric still dense. 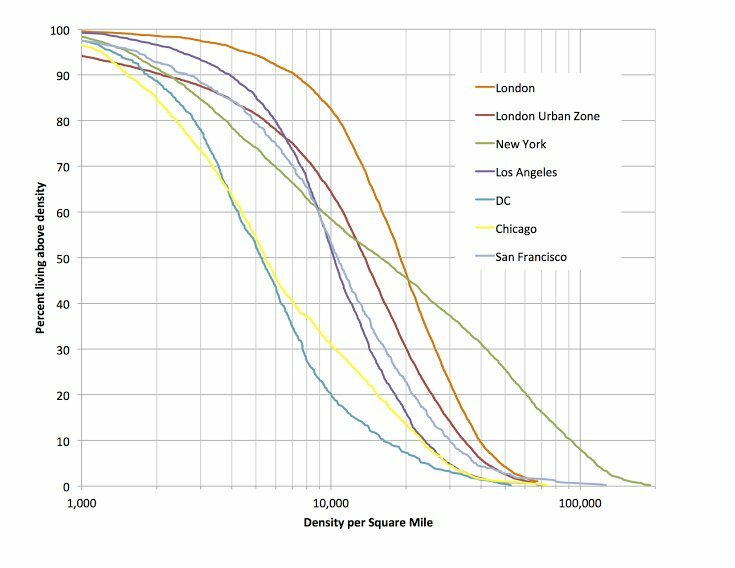 Neil’s chart above shows its density curve Lorenz-dominating those of Chicago and Washington, both of which have far higher transit usage. Unfortunately, I haven’t seen too much analysis of why. Jarrett Walker talks about Los Angeles’s polycentrism, comparing it with Paris, and boosting it as a positive for public transit. The reality is the opposite, and it’s worth delving more into it to understand why whatever density Los Angeles has fails to make it have even rudimentary public transit. The “well, actually Los Angeles is not autopia” line faces a sobering fact: Los Angeles has practically no transit ridership. In this section, I’m going to make some comparisons among American metropolitan statistical areas (MSAs); these exclude many suburbs, including the Inland Empire for Los Angeles and Silicon Valley for San Francisco, but Neil’s graph above excludes them as well, because of how the US defines urbanized areas. In the following table, income refers to median income among people driving alone or taking public transit, and all data is from the 2017 American Community Survey (ACS). The income numbers are not typos. In San Francisco, Washington, and Chicago, transit users outearn drivers. In New York the incomes are close, and US-wide they are almost even. But in Los Angeles, drivers outearn the few transit users almost 2:1. It’s not because Los Angeles has better transit in poor neighborhoods than in rich ones: this may have been true for a long while, but with the Expo Line open to Santa Monica, the Westside has bare bones coverage just like the rest of the city. Even with the coverage that exists, public transit in Los Angeles is so bad that people only use it if they are desperately poor. When public transportation is a backstop service for the indigent, ridership doesn’t follow the same trends seen elsewhere. Transit ridership in Los Angeles rises and falls based on fares; new rail extensions, which have led to big gains in ridership in Seattle and Vancouver, are swamped by the impact of fare changes in Los Angeles. Gentrification, which in New York has steadily raised subway usage in hotspots like Williamsburg and which does the same in San Francisco, has instead (slightly) contributed to falling transit usage in Los Angeles (p. 53). The two main indicators to look for are the rightmost two columns: the percentage of jobs that are in the CBD, and the job density within the CBD. These indicators are highly not robust to changing the CBD’s definition, but expanding the definition moves them in opposite direction. Washington and San Francisco can be boosted to about 400,000 jobs each if the CBD is expanded to include near-CBD job centers such as Gallery Place, L’Enfant Plaza, SoMa, and Civic Center. Manhattan south of 60th has 1.9 million jobs in 22.2 km^2. Even in Chicago, where job density craters outside the Loop, the 9 km^2 bounded by Chicago, Halsted, and Roosevelt have 567,000 jobs. In making the tradeoff between job density and MSA share, I tried to use smaller CBD definitions, maximizing density at the expense of MSA share. But even with this choice, the unusually low CBD share in Los Angeles is visible. This is what Jarrett and others mean when they say Los Angeles is polycentric: it is less dominated by its central business district than New York, Chicago, Washington, and San Francisco. However, the comparisons between Los Angeles and Paris are wildly off-base. I am not including Paris in my above table, because INSEE only reports job numbers at the arrondissement level, and the city’s CBD straddles portions of the 1st, 2nd, 8th, and 9th arrondissements. Those four arrondissements total 405,189 jobs in 8.88 km^2, but in practice few of these jobs are in the outer quartiers, so a large majority of these jobs are in the central 4.64 km^2. The overall job density is then comparable to that of the Los Angeles CBD, but the similarity stops there: CBD employment is 7.1% of the total for Ile-de-France. If there is a US city that’s similar to Paris on the two CBD metrics of density and employment share, it’s Washington, not coincidentally the only big American city with a height-limited city center. In all of the American cities I’m comparing in this post except New York, the share of the population using public transit to get to work is not much higher than the share working in the CBD, especially if we add in near-CBD job centers served by public transit like Civic Center and L’Enfant Plaza (and all of the Manhattan core outside Midtown). This is not a coincidence. Outside a few distinguished locations with high job density, it’s easy enough to drive, and hard to take the train (if it even exists) except from one or two directions. American cities are distinguished from European ones in that their non-CBD employment is likely to be in sprawling office parks and not in dense secondary centers. Paris is polycentric in the sense of having multiple actual centers: La Defense is the most conspicuous outside the CBD, but the city is full of smaller, lower-rise clusters: the Latin Quarter, Bercy, the Asian Quarter, Gare du Nord, the Marais. The 3rd, 4th, 5th, 6th, 7th, 10th, and 12th all have around 20,000-25,000 jobs per square kilometer, not much less than the Upper East Side (which has about 120,000 jobs between 60th and 96th Streets). A polycentric city needs to have multiple actual centers. Does Los Angeles have such centers? Not really. Century City has 33,000 jobs in about 1.1 km^2. Here is the city’s second downtown, with a job density that only matches that of central Parisian neighborhoods that nobody would mistake with the CBD. The UCLA campus has around 15,000 jobs. Downtown Santa Monica has 24,000 in 2 km^2. El Segundo, which Let’s Go LA plugs as a good site for CBD formation, has 52,000 jobs in 5.2 km^2. Downtown Burbank has about 13,000 in 0.6 km^2. The dropoff in commercial development intensity from the primary CBD is steep in Los Angeles. What Los Angeles has is not polycentric development. Paris is polycentric. New York is fairly polycentric, with the growth of near-CBD clusters like Long Island City, in addition to older ones like Downtown Brooklyn and Downtown Newark. Los Angeles is just weak-centered. In his original posts about weighted density from 2008, Chris noted not just the overall weighted density of an American urban area but also the ratio of the weighted to standard density. This ratio is highest in New York, but after New York the highest ratios are in other old industrial cities like Boston and Chicago. This ratio is in stronger correlation with the public transit modal share than weighted density. Much of this fact is driven by the fact that Boston, Chicago, and Philadelphia have high-for-America transit usage and Los Angeles doesn’t, but it still suggests that there is something there regarding the structure of density. In Chicago and Washington, the population density is low, but it follows a certain structure, with higher density in central areas and in distinguished zones near train stations. These structures are not identical. Chicago has fairly uniform density within each city neighborhood, and only sees this structure in the suburbs, which are oriented around commuter rail stations, where people take Metra to the city at rush hour (and drive for all other purposes). In contrast, in Washington commuter rail is barely a footnote, whereas Metro drives transit-oriented development in clusters like Arlington, Alexandria, Silver Spring, and Bethesda. In these islands of density, the transit-oriented lifestyle is at least semi-plausible. Paris has fairly uniform density within the city, but it has strong TOD structure in the suburbs: high density within walking distance of RER stations, lower density elsewhere. Some RER stations are also surrounded by job clusters oriented toward the train station: La Defense is by far the biggest and best-known, but Cergy, Val d’Europe and Marne la Vallee, Issy, Noisy, and Saint-Denis are all walkable to job centers and not just housing. Within the city there is no obvious structure, but the density is so high and the Metro so ubiquitous that transit serves the secondary nodes well. In Los Angeles, there is no structure to density. There are some missing middle and mid-rise neighborhoods, but few form contiguous blobs of high density that can be served by a rapid transit line. Koreatown is in a near-tie with Little Osaka for highest population density in the United States outside New York, but immediately to its west, on the Purple Line Extension, lie kilometers of single-family sprawl, and only farther west on Wilshire can one see any density (in contrast, behind Little Osaka on Geary lies continuous density all the way to the Richmond). With the exception of Century City, UCLA, and Santa Monica, the secondary centers don’t lie on any obvious existing or current transit line. With no coherent structure, Los Angeles is stuck. Its dense areas are too far away from one another and from job centers to be a plausible urban zone where driving is not necessary for a respectable middle-class lifestyle. Buses are far too slow, and trains don’t exist except in a handful of neighborhoods. Worse, because the density is so haphazard, the rail extensions can’t get any ridership. The ridership projection for the Purple Line Extension is an embarrassing 78,000 per weekday for nearly 15 km and $8.2 billion. The construction cost is bad, but in a large, dense city should be offset by high ridership (as it is in London); but it isn’t, so the projected ridership per kilometer is on a par with some New York City Transit buses and the projected cost per rider is so high that it is usually reserved for airport connectors. In a smaller, cheaper auto-centric city, like Nashville or Orlando, I would be entirely pessimistic. In Los Angeles there is exactly one way out: fix the urban design, and reinforce it with a strong rail network. The fact that this solution exists does not mean it is politically easy. In particular, the region needs to get over two hangups, each of which is separately nearly insurmountable. The first is NIMBYism. Los Angeles is so expensive that if it abolishes its zoning code, or passes a TOD ordinance that comes close to it, it could see explosive growth in population, which would be concentrated on the Westside, creating a large zone of high density in which people could ride the trains. However, the Westside is rich and very NIMBY. Metro isn’t even trying to upzone there: the Purple Line Extension has a 3.2-km nonstop segment from Western to La Brea, since the single-family houses in between are too hard to replace with density. Redeveloping the golf courses that hem Century City so that it could grow to a real second downtown is attractive as well, but even the YIMBYs think it’s unrealistic. The second obstacle is the hesitation about spending large amounts of money all at once. American politicians are risk-averse and treat all spending as risk, and this is true even of politicians who boldly proclaim themselves forward-thinking and progressive. Even when large amounts of money are at stake, their instincts are to spread them across so many competing goals that nothing gets funded properly. The amount of money Los Angeles voters have approved to spend on transportation would build many rapid transit lines, even without big decreases in construction costs, but instead the money is wasted on showcasing bus lanes (this is Metro’s official blog’s excuse for putting bus lanes on Vermont and not rapid transit) or fixing roads or the black hole of Metro operating costs. But the fact that Los Angeles could be a transit city with drastic changes to its outlook on development and transportation investment priorities does not mean that it is a transit city now. Nor does it mean that the ongoing program of wasting money on low-ridership subway lines is likely to increase transit usage by the required amount. Los Angeles does not have public transportation today in the sense that the term is understood here or in New York or even in Chicago. It should consider itself lucky that it can have transit in the future if it implements politically painful changes, but until it does, it will remain the autopia everyone outside urbanism thinks it is. I’m confused by your metric for employment in DTLA. It seems like you’ve chosen a limited area which shows fewer than 200K jobs, but DTLA actually has just shy of 450,000 jobs as measured by the LAEDC metrics. What does LAEDC define as Downtown LA? To figure out what to count as DTLA I drew a pretty wide polygon on OnTheMap first and got to 400,000 in a large area including Chinatown, a good proportion of lower Wilshire, and parts of East LA. Or is it a matter of different census sources disagreeing? OnTheMap draws data from LEHD, which sometimes disagrees with ACS numbers. I believe it is Chinatown, City West, and all of the area between the 110, 101, 10, and the LA River. Per LEHD data, if the boundaries of DTLA are the river, the 10, Sunset, and just north of Dodger Stadium, then there are 336,000 jobs in 23.5 km^2. Restricting to just the 10, the 110, the 101, and the river, it’s 273,000 in 11.5 km^2. So you get a bigger but much less dense CBD. For reference, job density in the municipality of Paris is 21,800/km^2, so on the looser definition of DTLA its job density is lower than that of an entire city, and even on the one bounded by the freeways the job density is barely higher than that of Paris. I’m not at the computer, only on the phone, so don’t have access to the data I once had, but I did a study in 2010 using data from the LAEDC. There were definitely almost 500,000 jobs in that defined area. The second largest concentration of jobs was Century City with 130,000 and then third, the port and fourth, the airport. The CRA at the time was arguing these numbers for further development in DTLA, which turned out to largely be residential development. I doubt it’s changed so much in 8 years. It’s interesting that LA had a rail system until the oil compounds bought the ROw….. The ROW is still there for those limited lines that weren’t streetcars, but LA was a streetcar city, not much different from Cincinnati, Baltimore, New Orleans, or the East Bay. LA has leftover ROW from its bicycle freeways, too. Should “behind Little Osaka on Geary” be Japantown? Los Angeles is dense, but the density is not transit-oriented. Like Kuala Lumpur, which you sometimes keep coming back to? Yeah, I wanted to blog about this in the context of middle-income cities like Bangkok and Istanbul (and I suppose also KL). They’re dense – way more so than Western cities, but there’s no structure to this density (where is the Istanbul CBD?). But it lost a Patreon poll to transit-oriented suburbs (forthcoming). I’m pretty sure the Istanbul is in Levent (Metro M2). They’re building one there right now, but it’s still in competition with Nişantaşı, Karaköy, and Bağdat. My late colleague Joel Woodhull made similar observations when he worked at the LA RTD in the 1970’s. As he said, LA is no Manhattan but it has a large area where density is high and not tapering off as in other regions. It was an argument to invest in more transit. It is an argument to invest in more transit, but TOD is still necessary – evidently, even on the densest corridor, Wilshire/Century City, projected ridership is painfully low. Compare with Geary, which has 55,000 weekday bus riders in 10 km today, on top of another 55,000 weekday riders on parallel streets. Is there reason to think the longer term ridership for the purple line will grow way more than the projected ridership in 2035? The ridership of the Wilshire bus is something like 50k-60k/day, it seems crazy to me that the subway line would only be around 70k. There’s good reason to think that improving Metrolink, extending the Crenshaw line to the purple line, and increased ridership from other light rail extensions will drive people to the purple line. I’d think the 2050 projection would be like double that of 2035. It still wouldn’t be huge but it would be respectable and the biggest in the LA system. Yes, there is reason to think that the ridership projections are conservative. The Expo Line projection was for 64,000 boardings/day in 2030, it is already at 62,000. The Purple Line estimates were prepared before the Expo Line opened, I believe. The recent Gold Line extension was projected to have 13,600 boardings/day in 2035, but it seems to have already passed that estimate. Ridership on the Gold Line before the extension opened was about 30,000/day, but now it is around 50,000/day. Another problem is that Los Angeles is enormous in terms of area. That makes it expensive to build a rapid transit network with decent coverage, and hard to convince anyone to ride it. Since the city is so big and, as you mention, unstructured, getting anywhere on transit is likely to require one (or more) transfers and/or a long travel time. Local/express service might help, but you’d still end up with a lot of transfers due to the weak centers. In Los Angeles, mid-rise density goes out about 40-50km from the CBD. Major destinations like Santa Monica, Long Beach, and Disneyland are 22, 30, and 40km from the CBD, respectively. In New York and Chicago, a 15km radius from the CBD includes most major destinations and dense neighborhoods. In Washington and Paris, most major destinations and dense neighborhoods are within 10km of the CBD. Could LA-OC ever be anything but “lol”? What level of capital investment would that take? For regional rail: start with Electrolink. OC to Downtown LA is doable – that’s a many-to-one problem and there are examples worldwide of express services and commuter rail going 40km out. But neighborhoods in OC to neighborhoods in LA is difficult – even with an ideal transit network you’d be looking at multiple transfers and a long travel time. Another problem is that Los Angeles is enormous in terms of area. …. Yes, though as Alon said, it is longer than 10km. The densest part of greater Paris is out to about radius of 15km, and corresponds to the Petite Couronne (inner ring) with approx. 7m residents. Disneyland-Paris is in the inner part of the Grande Couronne (outer ring), approximately 30km. On the other (west) side of Paris, in the Grande Couronne are Cergy-le-Haut (A3), Poissy (A5) and St-Germain-en-Laye (A1) which are about 40km, 36km and 30km respectively. All these are termini of the RER line A (A4 at Marne-la-Vallée-Chessy for Disneyland). The RER-A spans approx. 80km east-west and because it covers the densest parts of greater Paris, it carries >300m pax p.a. The Petite Couronne is a very dense circle but the Grande Couronne consists of several strings of density, mostly tracking the 3 main rivers (Marne, upper Seine, lower Seine). The demographics and geography of these entities are tabulated below, plus LA county. So, I think I see why Jarrett Walker says in some ways LA resembles Paris (meaning greater Paris). While the densities are very different, even out in the Grand Couronne (or further into Ile de France), the point is that quite a lot is served by rapid transit in the form of the RER; it serves most of the population in the Grand Couronne but further out it is really separate towns which are served by the suburban & regional train network, however parts of the RER actually extend outside the formal boundaries of Ile de France (a lot is still farmland so these av. densities are misleading and perhaps pop. weighted density would be better) eg. Melun (opposite side of the Seine to Fontainebleau) is the terminus of D2 but it is a town (density 4,700/km2) amidst farmland and national parks. In fact RER-D runs thru a dense strip along the Seine into Paris. Cergy-le-Haut is a railway station in Cergy, a Paris suburb. The station was built in 1994 by the Agence des gares (J.-M. Duthilleul, É. Tricaud) and receives trains from Gare Saint-Lazare as well as the RER. The station is half underground and was built in an area of openland fields, now built upon and is part of the network of stations serving the ville nouvelle of Cergy-Pontoise. It was part of a large project to develop the area and smart Parisian style buildings have been built next to the station around a plaza situated above the tracks. Cergy-le-Haut is not yet fully developed so fields are next to the station and next to seven storey high apartment buildings. Patronage is high so during the rush hours it is served by RER trains every ten minutes and by suburban trains every ten minutes. Cergy is listed as density of 5,000/km2, and the RER journey takes 42 mins with 13 stations (though I don’t know if all trains stop at all stations). Of course we’re talking about 160 years of rail development in Ile de France, and the RER used the old suburban rail ROW and it (RER) has been built over 42 years (already!) but it can be done. Oh, and BTW, I would guesstimate that Ile de France has a freeway network roughly comparable to LA county–these things are not incompatible. I briefly lived in Bry-sur-Marne (RER A, Marne-la-Vallée branch), so I am familiar with the Paris region. There’s definitely a bifurcation between between dense walkable/bikeable/transit-oriented neighborhoods where few people own cars and the suburbs where many people take the RER/Transilien to work but drive everywhere else. I said 10km to include La Défense and most of the cities inside A86. I was really just leveraging off your post to highlight the scale issues and that Walker’s comments re LA are not totally off the wall, as too many assume. As Paris keeps growing, quite a bit of that growth will be absorbed by places like Cergy and Poissy etc served by RER, and of course within about a decade or so, the new circumferential links that take pressure off the radials which are fit to bursting. The “10km”, which is most of the Petite Couronne, is already dense and will only absorb a certain amount more, not to mention property cost issues for those new Parisians (or strictly, Franciliens). There are also big employment centres like Saclay which is the focal point for M18 but which Alon doesn’t think they should build, or prioritize but he’s wrong on that. Saclay and its ‘new’ mega-university is in the Grande Couronne, about 20+km from Paris, halfway east-west between Versailles and Orly airport, and within spitting distance (well, a few transit stops) of the Gif-sur-Yvette, Orsay, and Jouy-en-Josas science research hubs. More reminiscent of Research Triangle Park NC, than of Cambridge (UK or Boston) and hits all the right buttons for a TOD and tech centre (already is …). (hmm, maybe that is going too far; more like Framingham I suppose). I note that Bry-sur-Marne is only 4 and 5 stops to Gare de Lyon and Chatelet respectively, and is 12.6km from the centre of Paris. There are another 9 stations beyond it on the same RER-A4 line that terminates at Marne-la-Vallée-Chessy. Which is just to repeat that the RER does effectively serve significant population at significant distance, almost LA-scale distance (even if the communes in all these places are themselves much denser than anything in LA, ie. transit-users walk to the RER stations). a bifurcation between between dense walkable/bikeable/transit-oriented neighborhoods where few people own cars and the suburbs where many people take the RER/Transilien to work but drive everywhere else. Quite. But there’s nothing wrong with that. It means the roads are a lot less congested for those who really need them in the working hours. But they’ll still use the RER on weekends if they want to do something in intramuros-Paris. Oh, another thing, since a new post has highlighted the cost of transit in LA: Bry-sur-Marne is just inside Zone 4 (of 5 zones; Melun, Cergy, Poissy and Marne-la-Vallée are zone 5, generally 30 to 40km out), but as I understand it, the weekly Navigo Pass is only €22.50 for unlimited travel including from zone 5. That is an amazing travel bargain, and I’ve always advocated that a fare structure that is too heavily ramped with distance from the centre is counter-productive against the very thing city planners aim for, ie. to get those suburbanites out of their cars. Ha, I’ve just realized that Donald could have got almost halfway to Bois Belleau (Belleau Wood) by taking RER-A4 to Marne-la-Vallée-Chessy. The RER is not stopped by heavy rain. It is about 75km to Bois Belleau with the American cemetery honouring the Marines who fought off the Germans in 1918. An extra bonus for him could have been a quick trip to Disneyland. Now that would have been surreal and well worth any disruption to Parisians. Oh, yet another bonus would be that Macron could have shown him the TGV station in the same place (Eurostar serves this direct from London). Trump is actually a fan, of sorts, of HSR–I remember during the ’16 election he grumped that it seemed every country he visited around the world had HSR except America. Come on, even French presidents don’t ride trains – the security is way too difficult. When Hollande traveled the country by TGV rather than by plane, they had to station soldiers to guard every railroad bridge. The rain argument about the chopper and motorcade was just the usual Trump BS. Obama and Biden arrived in D.C., for the inauguration, on a train. Technically he wasn’t President yet but the Secret Service was giving him similar security. If they had rebranded the graveyard as Trump(tm) Necropolis and explained to him that it is very difficult to get admitted to it he might have suffered a whole hour in a limo to get there and whole hour to get back. It may have involved umbrellas which he seems to have difficulty with. Come on, even French presidents don’t ride trains – the security is way too difficult. Gotta agree with adirondacker again. Twice in the same thread! Corsican eggs, it was total utter b.s. on the part of Trump. Appalling behaviour and disrespect. This was the defining battle by US Marines which established their rep, not to mention causing 10k casualties including 1800 deaths. Some journalists are reporting that the US military and ex-servicemen have considerably cooled on Trump and all his empty rhetoric. House Speaker Paul Ryan and a few other Republican politicians was on an Amtrak train that was involved in a fatal crash once. A whole train of conservatives? No, it’s not possible, surely? If only …. I don’t think that is enough to explain Why do conservatives hate trains so much? BTW, Bois Belleau is in my mind because I read about it earlier this year (its centennial was 26 May), and marked down as one of those things I should do when back in Paris. (Probably some Australians in that cemetery too; there were French and Brit. Empire forces along with the Marines. We’re very good at mass dying in other empires’ wars; in fact over 60,000 died in WW1, almost identical to American deaths.) In fact, I’ll sail “my” peniche from the Seine, into Canal St Martin then along Canal de l’Ourq which takes one all the way to Chateau Thierry which is the town just a few kms from Bois Belleau; it is also just outside of Ile de France, in Aisne and the first champagne house closest to Paris (almost in the banlieu). The war came very close to Paris and this was one of the key battles that stopped the Germans. Yeah, so, WW1 means a lot less to me than WW2, for reasons like “my family got massacred in the latter but not the former.” So when I think of the Somme and Marne I really do think just of the rivers. Alon, you and everyone, should care about these WW1 events because it was its aftermath that led directly to WW2 and all its horrors. Remember, those who don’t learn from history’s mistakes … In this context, right at this moment, Gaza comes to mind. My own existence was determined by millimetres in that my grandfather was shot on the Somme, but he survived and was repatriated to hospital in the UK. Of course more of the injured died of complications like infection (soon to be remedied by another Australian beavering away in Oxford at precisely the same time: Florey) but he was a tough SOB and, despite a very tough life and hard drinking and smoking, he died only months short of his 100th year. Not to mention my father whose Beaufort bomber was shot down, twice, in the Pacific war. So Alon, we are both accidental survivors of the random madness and barbarity of war. An interesting development in greater Paris: “On Monday, a large group of suburban municipalities agreed to ban all diesel-fueled cars built before 2000 inside the A86 Beltway, starting in July. In 2025, this will be upgraded to a ban on all diesel vehicles from before 2010, plus a ban on more polluting gasoline-powered cars built before 2006.” See the CityLab report by Feargus O’Sullivan (below). This is a very significant turnaround in the governing body of greater Paris (i.e Métropole de Grand Paris) may of whose mayors or political players (who tend to more conservative politics) bitterly resented Socialist mayor Anne Hidalgo’s closure of 3km of the riverside expressway (Voie Pompidou, runs from approx. Bastille-Arsenal to the Tuileries). They had launched court cases against her actions (arguing it was not in her powers as these were issues of national not city relevance) but last month they lost, Hidalgo won. This loss, combined with the change is people’s perception of such things (and some very bad air days for Paris, due almost entirely to those diesel vehicles) have produced this official turnaround. The thing about Paris is that it has most of the infrastructure to handle such a change or will have. Note that the timing of these measures parallels construction/completion of the Grand Paris Express (GPX) transit plan to build circumferential Metro and RER. One could easily look at most American cities, like LA, and see they are half a century or more behind, and throw one’s hands in the air, but really there is little choice. LA is on that course, and one hopes Houston doesn’t let its Harvey disaster go without exploitation to head in the same direction. Admittedly, by international standards, Greater Paris has decent public transit links with the inner city, with extensive rail networks threaded together with bus lines and a growing tram network. These links are great at connecting the periphery with the city center. What they aren’t so great at, however, is connecting suburban towns with their neighbors. By law, sure, but there are very large American cities with height limits. San Diego and San Jose have FAA height limits impacting their building heights significantly. I guess in the same way that before they relocated Kai Tak airport in Hong Kong, building heights in Kowloon were limited … to about 30 storeys IIRC. Though the immediately adjacent area and in the approach were limited to 6 storeys. Still, it was like flying into a canyon with walls defined by buildings. One of the most exciting landings that involved a sharp right-hand turn while on the final descent. I have a old VCR of it, that Cathay Pacific used to sell. Probably must be a version on YouTube I suppose. Back then, pre-1987, most buildings were built to the limit so it looked almost a table-top. Today they’ve got a 118-storey hotel and lots of 70 storey monsters. Oops, I wrote “pre-1987” when I meant “pre-1997” (when HKI opened and Kai Tak closed). Flying into HK may have lost that almost unique frisson, but it’s still pretty exciting. Even though HKI is 30+km away, the Cathay Pacific pilots still make a point of alerting pax to the vista of HK harbour etc. in the distance. You claim politicians wrongly chose spreading the funding for Measure M in 2016 but there is an easy comparison, Measure J in 2012, which failed. Both measures required 66.67% of voters to vote for it and was a 0.5% sales tax, but Measure J only funded 7 transit projects (it did not include the Gold Line extension) to be completed over 15 years, while Measure M funded about double the number of projects over a 40 year timespan. Measure J failed to pass and only got 64.6% in the San Gabriel Valley, whereas Measure M, which included the Gold Line extension, received 67.1%. Since the San Gabriel Valley is the largest bloc of votes outsidethe city of LA, getting their vote is crucial. Spending money on transit projects in the San Gabriel Valley is not politicians being risk-averse, it is politicians being realistic. Take away projects from the San Gabriel Valley and they will vote against providing funding for any transit projects. My biggest complaint is not the Gold Line extensions (even though they’re pretty bad), it’s the road and bus money. Basing the question on an issue poll is exactly risk-aversion. Issue polls are extremely volatile, and respond to political endorsements and to what’s on offer. Very interesting post. I think more focus needs to be placed on the income part of transit. I think too many advocates try to apply a one-size fits all approach to how transit and ridership mesh together, especially with the constant call for more service = more ridership. As you pointed out, in some areas, lower fares is the only way to build ridership. A bus or train every 3 minutes wont draw riders if the fare is $3.50 and the median income is $18,000. The BART-to-Oakland Airport connector cost ~$500 million to build for 3.2 miles. It costs $6 for a one-way ride. Essentially, no airport employee is going to use it as-is, and a family of four headed to the airport will take Uber. When BART ran itself to San Francisco Airport (SFO), the airport surcharge meant no employees used BART (the airport implemented a free shuttle bus for them running parallel with BART). Eventually, BART agreed to have a $5 daily discount for airport employees. Note that ~14000 people are eligible for special employee/family/retiree/board-member discounts to ride BART (a non-trivial number). Ooh, that’s a good example. New York has this, too: JFK passengers take taxis or the AirTrain, employees drive or take the Q10 bus. The AirTrain costs $5.50 one-way, without free transfers to the subway. It’s an Anglosphere thing. The privately run airporters to London-Heathrow and Sydney-Kingsford-Smith went bust (and wrung absurd subsidies from government rather than fare price drops or concessions) because they didn’t give any discounts to those tens of thousands of airport workers. I don’t know what the situation is for CDG, except that of course almost all Paris resident-workers get massive discount on Navigo Passes (well, they used to on Carte Orange and I assume that tradition continues). It so obviously is that private transit and public policy goals don’t work together. The original owners went bust but the NSW government has never subsidised the airport fee for the private company that owns it. In fact, 85% of the gate fee goes to the government, the private company only keeps 15%. In fact, last year the government made $87 million from the gate fees. However, the owners recently made a proposal to the government to increase their take though, let’s see how that goes. The amount the government collects is offset by the state having to “compensate” the company for passengers using Green Square and Mascot stations on the Airport Line. In 2016, the compensation was estimated at $22 million. In 2011, the Keneally Labor government decided to subsidise the access fees at Mascot and Green Square, leading to a surge in patronage. Almost a quarter of people taking ground transport to and from Sydney Airport opt for the train. The whole thing is a mess due to the failed attempts to build and run it as a PPP. Quelle surprise! The reason for the payment of the company (Airport Link, wholly owned by a British pension fund) to the government is the “airport station access fee”, and it happens that this is also the biggest contribution to the ticket cost. After the thing first went bust–due to low patronage because of (quelle surprise) high fares–the government, instead of buying the thing back cheaply on behalf of we the people, gave income guarantees plus those subsidies as referenced. This was because of the low patronage, but as indicated above that finally turned around and has increased 42% on the 2011 figures. This of course means that the subsidies cost increases but also the return payments to the government for those station access fees. This whole farago is due to the current government (conservatives likely to lose in the upcoming election) willing to do anything to keep this thing (and anything they build, eg. the $18bn WestConnex tunnels, even before they have been completed) privatised. Most want the damn thing run for the public by the government or at least a contracted organisation not intent on ripping us off. (see below, re the Tourist Bureau). The current company has does some economic footwork and realised that by paying the government an undisclosed (!) but assumed hundreds of millions of dollars to grab a bigger share of this gusher. They know the price of that money will be more than worth the extra revenue; while of course this government, on the way out and the very definition of short-termist will get a short-term injection of funds. Brilliant. Especially when some of these soon-to-be unemployed politicians will be looking for a comfy private sector job (not restricted to conservatives). THE tourism industry is renewing a push for the government to cut the price of tickets on the airport rail line, which charges passengers an extra $12.30 for every trip. A report by the Tourism and Transport Forum claims the cost of travelling to the CBD from the airport works out, per kilometre, to be one of the most expensive airport trips in the world – about $2 a kilometre. A TTF survey of global cities found it costs less than $1 a kilometre to travel to the centre of the city from airports servicing Paris, Beijing, New York, Melbourne, Copenhagen, Brussels and London. The rail line to Sydney Airport was the first of the city’s many troubled public-private partnership projects. The original AirportLink company went into receivership in 2000 after high fares discouraged customers. The line was purchased by Westpac four years ago, and has begun generating healthy returns. But the rapid growth of residential development surrounding Green Square has increased pressure on the state to lower the cost of using the line. A station access fee charged by AirportLink adds $2.60 to every trip from Green Square and Mascot. The government considered either buying the line or reimbursing station access fees to AirportLink, but has settled on the second option, expected to cost about $5 million a year. An industry lobby group, the Tourism and Transport Taskforce, yesterday called on the government to buy the line, which it said would help ease the chronic congestion on the M5 East and M5. “At the moment, the airport is served by a rail line with a prohibitive access fee, which makes it an unattractive option,” the taskforce’s chief executive, John Lee, said. He said the number of people using Sydney Airport was expected to be more than 70 million in less than 20 years. The government could have bought the line relatively cheaply when it fell into receivership. But patronage on the line has been growing rapidly, and AirportLink’s profits jumped 60 per cent last year, from $5.8 million to $9.3 million, increasing the cost of any deal. Robyn Ironside, 11 Sept 2018. Airports Association wants the consumer watchdog to stop monitoring the cost of car-parking at Sydney, Melbourne, Brisbane and Perth airports because of the regulatory burden involved. Robyn Ironside, 10 Sept 2018. Jennifer Hewett, 6 June 2018. Annabel Hepworth, 26 April 2018. Cool, but I thought you were talking about subsidizing the airport stations itself, which is not the case really. Also, even if they paid $22million for Green Square and Mascot they still made $87million which leaves the >$50m for the government. Of course, none of this excuses the high gate fee and it is a rip off make no mistake but this isn’t a bad deal for the government the way you say it is. If I go to the airport, I personally try and avoid the station. I get the 400 or 420 bus. Newark as well. The AirTrain is $5.50. Meanwhile, the local bus ($1.60) runs standing room all day filled with airport employees. Which bus? There’s more than one. I’m gonna assume the go28. Taking the train from Bloomfield to Secaucus to get to Newark Airport takes 40 minutes, the bus takes 45 to get to the end of it’s route in the airport. And goes places Airtrain doesn’t go. Getting to Bloomfield Station or alternates might not be particularly quick either. WIly wily New Jerseyans know how to change buses on Broad Street, I suspect many of the people on the bus are transferring from another bus line along Broad Street. Or one of the buses that are on Market. Or parallel lines. The 37 brings in locals from Newark and Irvington. The 107 replaces the 37 for late night trips and serves the same purpose. I have never taken the Go28 which brings in the folks living in Bloomfield. Theres also the 40 which I have never taken, and has an odd route. People take the 107 instead of the 37, if it comes first, during the day too. If they are going between Ivy Hill and Irvington Center they can even use the express 107. Having the airport employees change to AirTrain would just be annoying. Having the people who are using it to get to Beth Israel Medical Center or Irvington Center would use Airtrain would be even more annoying. If the trains in LA come every 3 minutes and serve more than just Downtown, Koreatown, and Hollywood, the median income on transit will suddenly be a lot higher than $18,000. LA is not Sioux City, where the middle class will always drive. Currently I could take metro link, there’s a stop close to my job and a stop close to my home. But I don’t because my hours are not reliably regular, metrolink only comes once per 75 minutes. It is easy to time the morning trip, but timing the return trip is not a risk I’m willing to take, if even a slightly normal delay happens at work, or I very slightly mistime my departure from work and I’m completely stranded for over an hour–and the metrolink stations are miserable little hellholes to wait at. If the headway were every 15 minutes, I’d strongly consider it, but then the big problem is the immense fares. It would minimum cost quadruple the cost of driving to go the 25 miles (I have an electric LEAF) I traverse, and I still have to make a car payment even if I’m taking the train. Since LA is a freelance city, My jobs change a couple times a year and I can’t just get rid of the car if I have a five month stint near a metrolink station, as I currently do. And then the third problem preventing me from taking metrolink is the time spent on the train. With an electric car, traveling 25 miles can take only 35 minutes and I have flexibility to do other things at the end of the day or in the middle of the day as life-needs dictate, with metrolink, traveling 25 miles (two or three stops in between) would take 45 minutes and I have no flexibility. If I were traveling all the way into downtown LA, metrolink would quickly make up the difference and then start creating advantages on time. but most of the 25 miles I travel are more lightly congested, so the train is usually slower than the carpool lane for my trips. And I still need to solve the last mile problem, which is likely going to be uber or lyft, because bus connections are not timed, so there is a lot of dead time waiting to transfer at both daily trips and that would add immense duration to the overall trip time. But taking lyft twice a day just further blows up the budget beyond the high fare cost on metrolink, making taking the train even more unattractive, financially. all that said there’s a couple things about los angeles to consider. The lack of north south arterials (freeway or surface street) west of La Cienega. Functionally, this cascades to cripples movement throughout the city on both transit and on the freeways and is the primary reason the 405 is such a nightmare. So much so are the north south arterials a problem, that a new North South transit arterial EAST of la Cienega, the elevated Crenshaw north light rail line above la brea), is projected at more than 90,000 daily riders–more than the East West HRT purple line and while missing all the job clusters in it’s locale! The travel time on the proposed elevated rail would crush driving time, being 3-5 times faster than car. Then there is The East west mountain range dividing the basin from the valley. West of the 101, there is only one arterial highway and one arterial street (405 and Sepulveda) bridging this divide, they are adjacent, and the transit on both is pathetic-to-nonexistant. This mountain range effectively prevents Valley residents from using transit to access the basin and segregates the Valley transit dependent from accessing the basin. and third, RACE, south of downtown and east of downtown have strong extant racial segregation in large swaths of the region. this racial component has driven and will continue to drive systemic disinvestment in these parts of the county, both in transit services and in larger investment in the growth of the metro. Race has inadvertently bled over immensely into your analysis, as you’ve largely confined the areas you have discussed to areas that are more white than the parts of the county that go unmentioned. But a lot of this is beside the point, The consent decree the Bus Riders Union forced on metro expired a few years ago, and now Metro has no longer been under court order to maintain high quality bus service, Metro has allowed their bus service to deteriorate immensely. The expiration of the consent decree combined with undocumented persons being able to legally acquire a driver’s license has significantly reduced bus usage. Major investment in buses would be far smarter on Los angeles’ part, but it doesn’t have that politician erection-generating component that rail does, so unless we elect a lot more women, we’re unlikely to get a smart and mega investment in improved bus service. Yeah, race is an unspoken issue in my post, as is socioeconomic class. It comes from the fact that job sprawl usually heads in the direction of where the rich live. It’s the same over here – La Defense is due west of city center, and the favored quarter is west to southwest. It’s convenient if you’re wealthy, and a nightmare if you live in a project in Seine-Saint-Denis. Washington sees the same movement (the favored quarter is in the west, and that’s where Tysons is) – it really does have a lot in common with Paris. As I understand it, the sequence is usually rich residents -> high-end retail -> hotels and office space. Even Midtown Manhattan developed this way, centered on Fifth Avenue, which commercialized south of 59th Street, before zoning. This hadn’t occurred to me. How much does having the property taxes of the Los Angeles Country Club frozen in amber forever have to do with not redeveloping it? Corporations, I assume the golf club is a corporation, live forever… nah, if it was sold everybody would probably want to make it into a park. If they haven’t tried to make it into a historic landmark that freezes it into amber another way. The LACC has been very resistant to hosting big tournaments and this is its first for 80 years: (LA Times). The Beverly Hilton rises above the trees beyond one green. Westwood towers overhead to the west, Century City to the south. The juxtaposition should make for good television. LACC officials hope those scenic shots will further enhance the reputation of a club that regularly ranks among the top 100 in the nation. Revenue from the lease will help pay for renovations, which ultimately will include both courses and the clubhouse. GOLF COURSES in California got a special exemption from taxes and best use land regulations long before Prop 13 courtesy of the republicans of course, and some help from Hollywood golfers like Bob Hope. Malcolm Gladwell detailed how it came to pass that we have thousands of acres of golf courses in california cities, but no public parks. There is a “San Francisco” tucked with central Los Angeles. It represents about 20% of the city population and 10% of the city land area. Does it have San Francisco’s transportation mode choice?